Abstract. As Arctic regions warm and frozen soils thaw, the large organic carbon pool stored in permafrost becomes increasingly vulnerable to decomposition or transport. The transfer of newly mobilized carbon to the atmosphere and its potential influence upon climate change will largely depend on the degradability of carbon delivered to aquatic ecosystems. Dissolved organic carbon (DOC) is a key regulator of aquatic metabolism, yet knowledge of the mechanistic controls on DOC biodegradability is currently poor due to a scarcity of long-term data sets, limited spatial coverage of available data, and methodological diversity. Here, we performed parallel biodegradable DOC (BDOC) experiments at six Arctic sites (16 experiments) using a standardized incubation protocol to examine the effect of methodological differences commonly used in the literature. 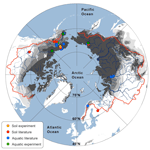 We also synthesized results from 14 aquatic and soil leachate BDOC studies from across the circum-arctic permafrost region to examine pan-arctic trends in BDOC. 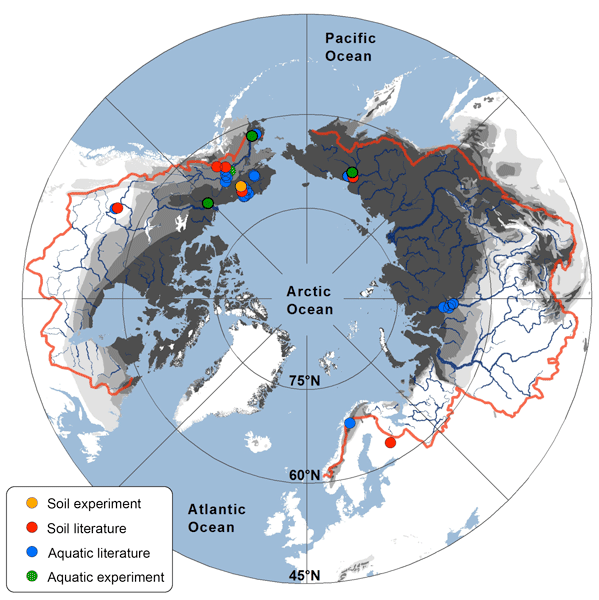 An increasing extent of permafrost across the landscape resulted in higher DOC losses in both soil and aquatic systems. We hypothesize that the unique composition of (yedoma) permafrost-derived DOC combined with limited prior microbial processing due to low soil temperature and relatively short flow path lengths and transport times, contributed to a higher overall terrestrial and freshwater DOC loss. Additionally, we found that the fraction of BDOC decreased moving down the fluvial network in continuous permafrost regions, i.e. from streams to large rivers, suggesting that highly biodegradable DOC is lost in headwater streams. We also observed a seasonal (January–December) decrease in BDOC in large streams and rivers, but saw no apparent change in smaller streams or soil leachates. We attribute this seasonal change to a combination of factors including shifts in carbon source, changing DOC residence time related to increasing thaw-depth, increasing water temperatures later in the summer, as well as decreasing hydrologic connectivity between soils and surface water as the thaw season progresses. Our results suggest that future climate warming-induced shifts of continuous permafrost into discontinuous permafrost regions could affect the degradation potential of thaw-released DOC, the amount of BDOC, as well as its variability throughout the Arctic summer. We lastly recommend a standardized BDOC protocol to facilitate the comparison of future work and improve our knowledge of processing and transport of DOC in a changing Arctic. How to cite: Vonk, J. E., Tank, S. E., Mann, P. J., Spencer, R. G. M., Treat, C. C., Striegl, R. G., Abbott, B. W., and Wickland, K. P.: Biodegradability of dissolved organic carbon in permafrost soils and aquatic systems: a meta-analysis, Biogeosciences, 12, 6915-6930, https://doi.org/10.5194/bg-12-6915-2015, 2015. We found that dissolved organic carbon (DOC) in arctic soils and aquatic systems is increasingly degradable with increasing permafrost extent. Also, DOC seems less degradable when moving down the fluvial network in continuous permafrost regions, i.e. from streams to large rivers, suggesting that highly bioavailable DOC is lost in headwater streams. We also recommend a standardized DOC incubation protocol to facilitate future comparison on processing and transport of DOC in a changing Arctic.